• Any masonry heater or any other solid fuel-burning device that meets performance standards. PHOENIX – For 20 years, no-burn days have required residents and businesses to refrain from using wood-burning fireplaces, fire pits and wood stoves to reduce air pollution in metro Phoenix. While the Maricopa County Air Quality Department has largely relied on members of the public to seek out that information out themselves, officials are partnering with the Arizona Department of Environmental Quality for a second straight year to offer a multiplatform advertising campaign. The county recently invited the public to a brown bag event at which officials demonstrated ways to learn about no-burn days. 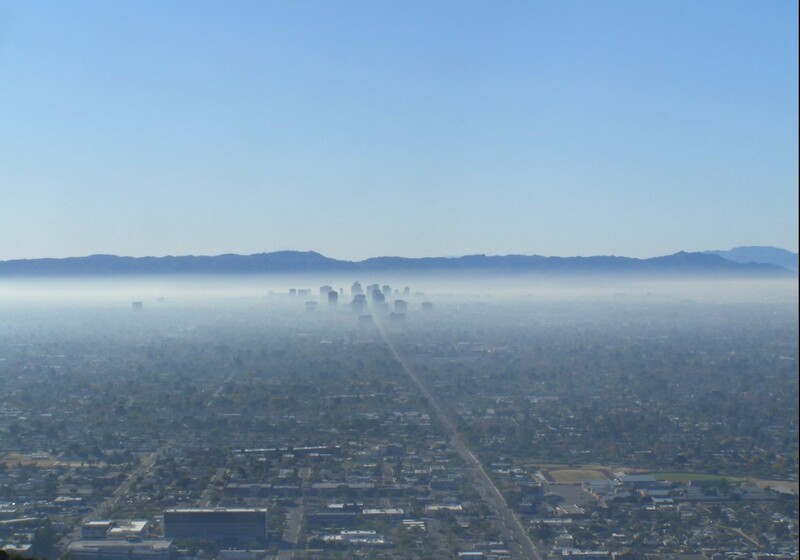 It isn’t just the health of individuals at stake in the campaign: Maricopa County risks falling into non-attainment if the amount of particulate matter in the air exceeds levels set by the EPA for three straight years. Huhn said counties in non-attainment can lose federal funding, and would see tougher restrictions, including additional days when repeat offenders wouldn’t be allowed to burn. “We wanted to be proactive, we wanted to prevent that from happening,” he said. In order to accomplish that, the county has partnered with ADEQ to put together the No Burn campaign, with a dedicated website that shows whether a no burn day has been declared as well as highway street signs and a smartphone application. ADEQ will also help out with print, radio and television advertising, the bulk of which will occur in late December and January, according to Mark Shaffer, communications director for the agency. “Based on surveys we sent out before and after the campaign, we had a big jump in awareness last year,” Shaffer said. County officials are expecting even more involvement this year, with 74 groups involved in the No Burn campaign, including the Arizona Restaurant Association. “The data we got last year showed that the campaign worked,” Huhn said. Cheri Topel, air quality inspector for the Maricopa County Air Quality Department and speaker at the presentation, said that the brown haze that is sometimes visible over greater Phoenix is mix of nitrogen dioxide and sulfur dioxide. It mixes with soot and other particles in the atmosphere to create fine particulate matter. From there, the particles typically get blown out of the Valley, but Topel said that during the cooler months, the pollution particles stay closer to the ground, in a process known as inversion. “Numerous studies link particle levels to increased hospital admissions and emergency room visits,” she said. Topel added that specific health risks include lung and heart complications, including heart attacks. While the population at large rarely sees a significant health risk, seniors and young children can be affected by certain levels of pollution. “Children’s lungs are still developing, so they can be at risk from particles,” Topel said. Greater Phoenix also faces unique challenges, being located in a valley, which can cause problems when warm air gets trapped. “Geography is probably our worst problem,” Shaffer said. These dangers are part of the reason why ADEQ looked into ways to keep the particles out of the air during sensitive times of the year. Huhn said that no burn season formally stretches from Oct. 1 to Feb. 1. Last year, he said that there were 10 days with a full restriction, mostly surrounding the high-pollution days of Christmas and New Year’s Eve. “We don’t want to be the grinch, but that’s when concentration levels are the highest,” he said. Kim Butler, acting manager for compliance and enforcement for the Maricopa County Air Quality Department, said inspectors travel around and respond to citizen complaints on no-burn days. First offenders typically only see a warning, but repeaters can see fines of up to $250. While burning wood for cooking is a exempted from the no-burn restrictions, Butler added that restaurants and resorts that burn wood for ambiance aren’t only subject to the same restrictions as private residents but may face higher fines. 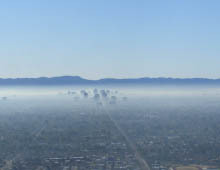 Haze obscures central Phoenix on Christmas morning in 2006.